Paolo DsLR: October 31 - Here We Go! This blog just keeps reaching new heights of ludicrosity. Yes, I made that word up. 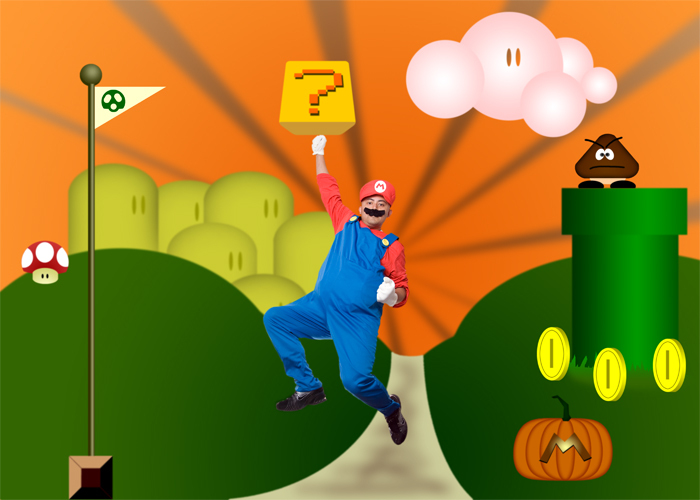 When I received my Mario costume last week, I got this crazy idea of Photoshopping myself into some sort of Mario world. Rather than steal the background from somewhere online, I decided to draw it myself. Anyway, hope you all had a fun Halloween weekend. OMG, this is the most awesome thing EVER! You did not disappoint me! My hat is off to you, Mario! You drew this yourself?! I am seriously impressed! Fire power! I'm glad I didn't disappoint you! It was actually kinda funny as I was reading your card. Coz I knew I had something pretty elaborate planned. Otherwise, it really would have been a lot of pressure!